Recently I have been on a Christian fiction binge! I love the way some of these amazing authors bring to life the stories of the old testament and shed light on some of these amazing trailblazers. It makes me want to go to the Word and read and re-read these incredible stories of faith, love, hope, tragedy, and war. I am convicted when reading these incredible tales of bravery. I love to imagine all the scenes played out in my head like a movie. 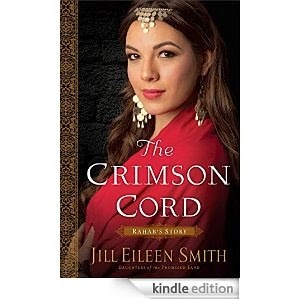 My most recent indulgence in all of it's old testament glory was The Crimson Cord: Rahab's Story by Jill Eileen Smith. It told the heroic story of Rahab, the prostitute, that allowed safe haven for Israel's spies as they entered the town of Jericho. The spies sought out the land to see what they were up against, ordered by Joshua their leader at the time. Now in the Bible it doesn't say much more than she hid the men from being discovered and stated to them that she believed in their God. She pleaded with the spies that when they returned with the camp of Israel to please spare her and her family's life from certain death. They agreed and Rahab and her family lived. But what the book goes into detail is answering some of those questions that the Bible doesn't give us answers for. Here is where there is a lot of speculation as to how and why a women with such great faith would have ever entered into a profession such as prostitution in the first place. What led up to her belief in God when Jericho was being condemned for it's wickedness and sin? What happened to Rahab's family and her future after they joined the camp of Israel, or did they? There are a lot of what if's that we just don't know, but Smith does an incredible job of using supporting scripture throughout the book to fill in some of these gray areas. It is a beautiful story of faith and perseverance despite extremely difficult circumstances. In Rahab's case she was sold into prostitution to cover the debts of her husband Gamal due to his excessive gambling habit. I won't spoil the end for you, but grab a box of kleenex as you watch the redemption and restoration of Rahab's life unfold in the arms of a Savior that shows her what unconditional love is from a father/husband's point of view that was never before modeled for her.Who would have thought that a sinner that should have been condemned to die along with her people was in the lineage of Jesus Christ! I have always loved this story in the bible, thank you for your review! I think I will be looking to get this book! This is a wonderfully written review. I personally don't gravitate toward fiction books at all, but you have piqued my interest. I will have to take a look at this one! Keep up the good work!